As the Mari minority in Russia learned about the move to protect its rights initiated in the European Parliament, their leading organisations jointly published an open letter. The authors point that a traditional holiday, The Day of the Mari Hero, is celebrated on 26 April when the Mari issue will be discussed at the European Parliament. They express their gratitude to members of the European Parliament and to all people who have put their signatures under the Appeal on Behalf of the Mari People open on the web page www.ugri.info/mari. This time, the Day of the Mari Hero will be unusual. On the same day in Brussels one of the working groups of the European Parliament will be discussing the issue of infringement on human rights and violation of democratic norms in the Republic of Mari El. The European MPs scarcely know that the Mari nation has a holiday called the Day of the Mari Hero and that they will hold their discussion exactly on this date. But what a concurrence! May we express our gratitude to the deputies of the European Parliament for their care for the future of our people. Using the occasion, we congratulate our compatriots with the holiday and also thank all people from all around the world for putting about 10 000 signatures of solidarity and in support to our people on the Internet! Organisation of Mari Youth 'U Viy'"
November 21, 2001: Aleksandr Babaykin, assistant chief editor of the opposition newspaper The Good Neighbors, is brutally killed in the centre of Yoshkar-Ola, the capital city of Mari El. November 2001: Leonid Plotnikov, assistant chief of department of the publishing house Periodika Mari El, is killed. November 2001: Aleksei Bakhtin, journalist of a regional newspaper, is killed. March 12, 2002: Vladimir Maltsev, chief editor of the newspaper The Good Neighbors, is attacked in the evening and caused severe bodily injuries. March 14, 2002: The door of the Vladimir Maltsev's apartment is poured over with fuel and put on fire by unknown persons. April 16, 2002: Viktor Nikolayev, Member of Consultative Committee of Finno-Ugric Peoples and Chairman of the all-Russia movement Mer Kanash, is attacked and brutally beaten in front of his house. Nikolayev had just called the 6th extraordinary Mari Congress due to be held on 26 April. August 14, 2004: a pogrom is made in the apartment of Valentin Matveyev, a public figure and author of critical articles in The Good Neighbors. October 4, 2004: masked bandits, armed with weapons and acting in the name of the Department of Criminal Investigations, attack the apartment of an employee of the human rights organization Citizen And Law. 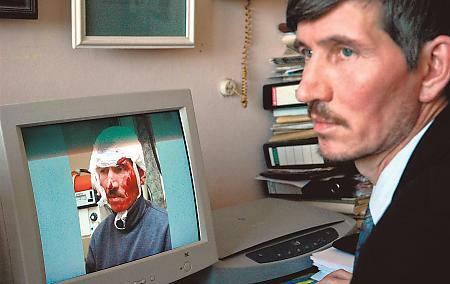 October 2004: journalist Vitaliy Igitov is attacked. Earlier, in personal conversations, Leonid Markelov called Igitov the man who had insulted him most. January 7, 2005: correspondent of the Radio Liberty / Radio Free Europe Yelena Rogacheva is attacked. February 7, 2005: Vladimir Kozlov, chief editor of the international Finno-Ugric newspaper Kudo+Kodu, Member of the Consultative Committee of the World Congress of Finno-Ugric Peoples and leader of the all-Russian movement of Mari people Mer Kanash, is attacked and severely beaten.